Consider The Reasons: Fideism No Longer a Viable Option. The Numbers Say It All. 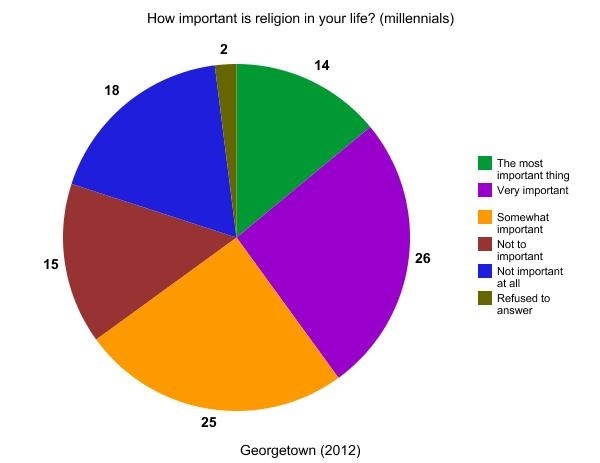 In 2012, Georgetown University did a poll of around 2,000 college-aged millennials on various topics and one had to do with if they changed from their childhood religion or not. 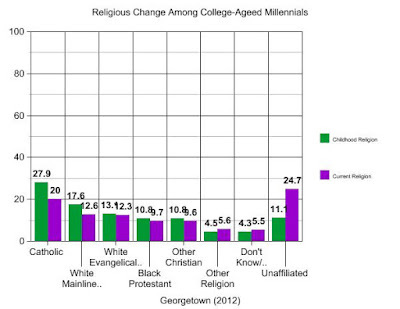 Christian's lost the most vs. other categories while the "unaffiliated" gained the most. Georgetown also asked the Christians and unaffiliated if Christianity taught the basically the same thing as other religions. Around 2/3rds of both groups voted yes that Christianity basically taught the same thing as Islam, Buddhism, etc. 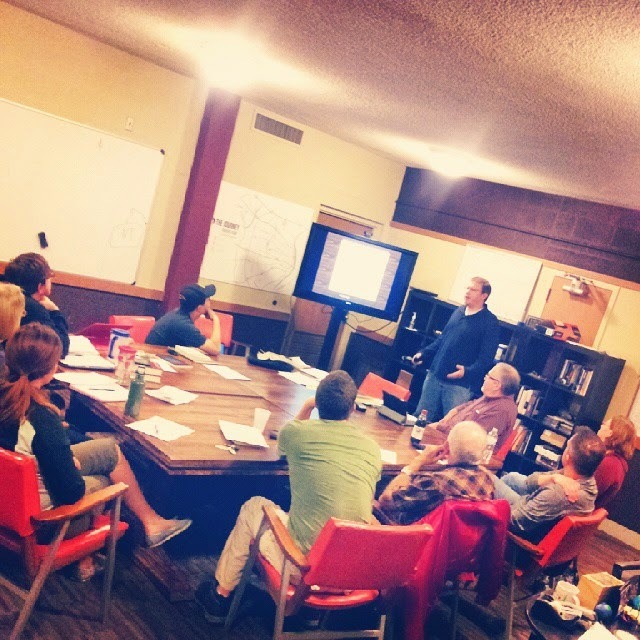 Evaluation: Relational and rational apologetics can be used to engage the mind of the college aged millennial which seems to be missing in their experience with church. This would help turn the tide of most unaffiliated and even Christians themselves being disengaged and most thinking Christianity teaches basically the same thing as other religions. 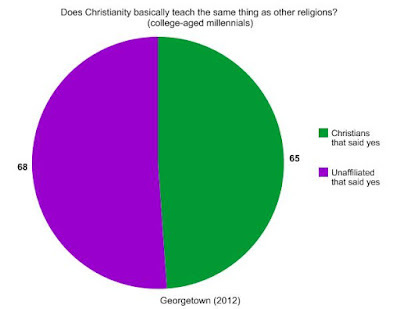 Georgetown's findings that two-thirds of college-aged Christians thinking that Christianity basically teaches the same thing as other religions should be alarming enough to promote change in how we approach teaching college-aged individuals. 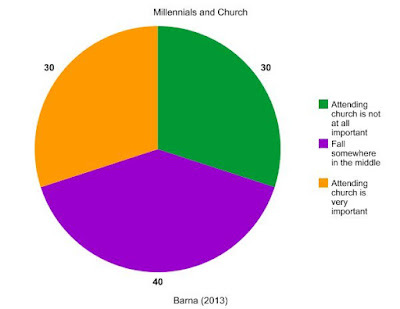 Moreover, Barna reports in 2011 that, "59 percent of young people with a Christian background report that they had or have 'dropped out of attending church, after going regularly.' A majority (57 percent) say they are less active in church today compared to when they were age fifteen. 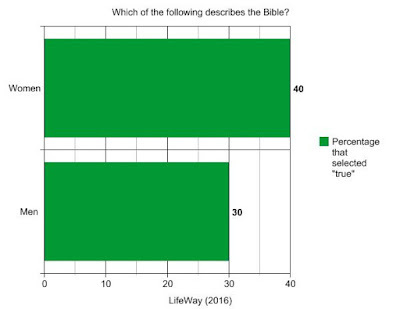 Nearly two-fifths (38 percent) say they have gone through a period when they significantly doubted their faith. 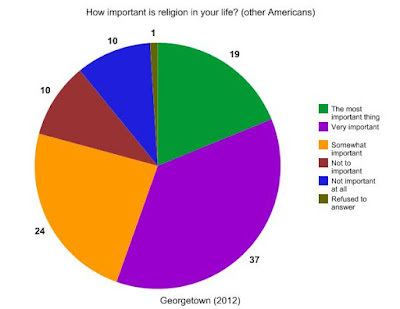 Another one-third (32 percent) describe a period when they felt like rejecting their parents’ faith." I would contend that the church is partly to blame for these numbers as we are not meeting the needs of our young people. 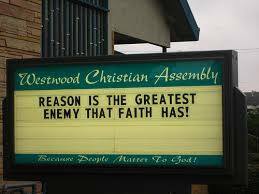 Relational and rational apologetics would aid individuals, especially those with doubt. Telling someone Hebrews 11:1 (which is really taking that verse out of context) is probably not going to work most of the time as the numbers indicate – in essence, fideism is no longer a viable option for Christianity. The more educated you are the more skeptical you are of the Christian worldview including the Bible itself. 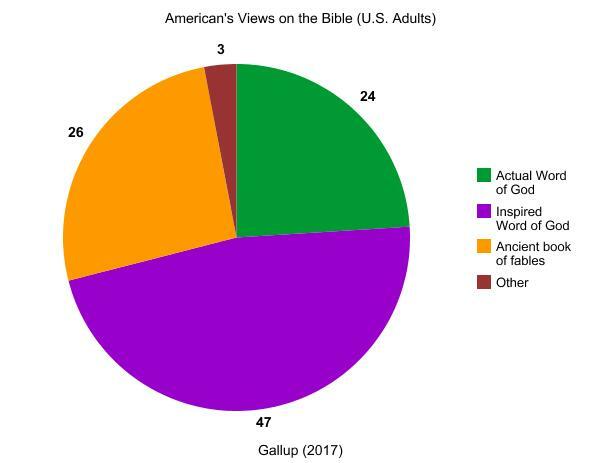 Gallup polled Americans in May of 2017 asking individuals to affiliate the Bible with the best description between three categories. 1. Actual word of God to be taken literally 2. Inspired Word of God, though not always to be taken literally 3. Ancient book of fables, moral precepts, etc. 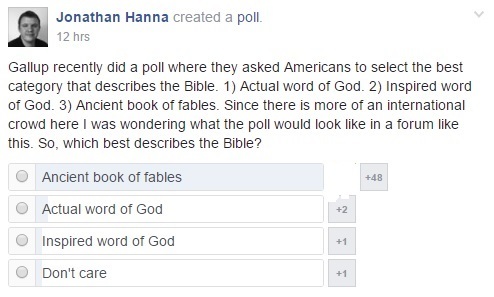 The first category the more education you had the lower one rated if the Bible was the actual word of God. 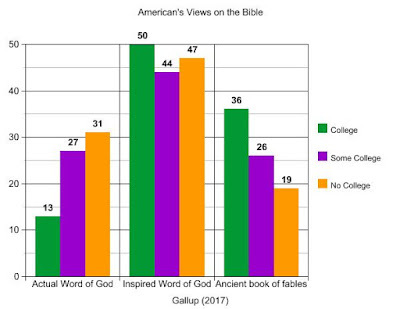 Granted, the more college one had the higher one rated the second category of saying the Bible is the inspired word of God. 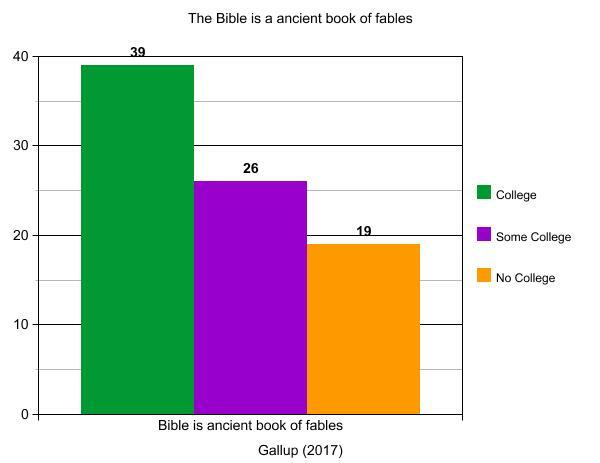 However, notably, the more college one has the higher the view that the Bible is a ancient book of fables would go. 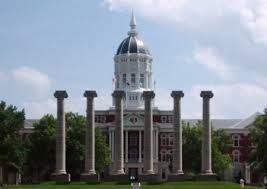 No college vs college had a almost twenty percent difference. 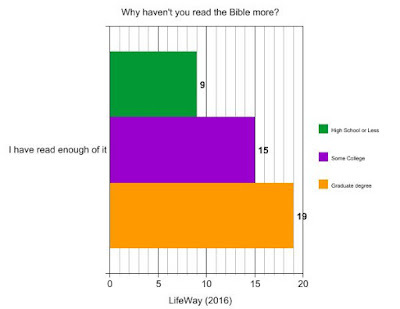 In the same survey, individual were asked "Why haven't you read the Bible more?" Individuals with more education were more likely to vote that "I have read enough of it." Evaluation: Like college-aged millennials, the life of the mind is not being fulfilled for these individuals within the church context even though it is valued by Christ himself (Matt 22:37) and Paul (Rom 12:2). More relational and rational apologetics would engage these individuals to look to the Scriptures as containing truth by considering biblical exegesis and building a cogent hermeneutic. In other words, proper biblical interpretive method looking at the background of the text (exegesis) and see how it applies today (building a hermeneutic). A humble deeper understanding would be a good dose of spiritual and intellectual food for those who desire it. That being said, fideism is no longer a viable option for Christianity. Gallup also asked men and women to describe which of the three categories best described the Bible. 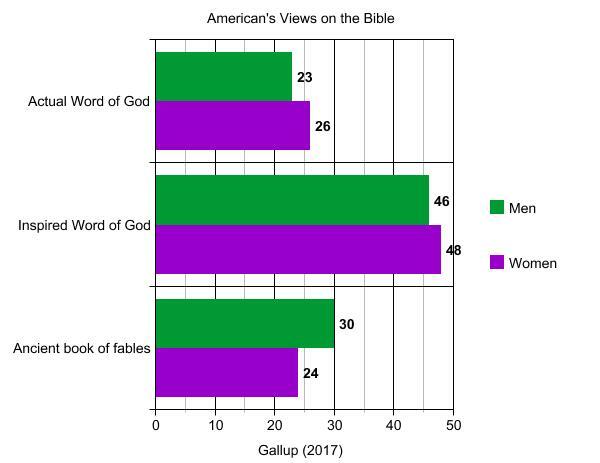 Women slightly voted higher than men that the Bible falls into the category as the 1) Actual Word of God to be taken literally or the 2) Inspired Word of God, though not always to be taken literally Notably, men more often than women voted that Bible was a 3) Ancient book of fables. Similarly, like we covered above for those with more education, LifeWay asked individuals "Which of the following describes the Bible?" 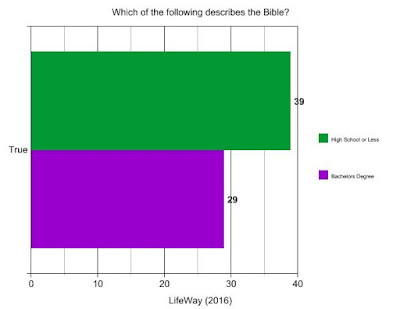 Women were more likely to vote that the Bible was "True" than men. 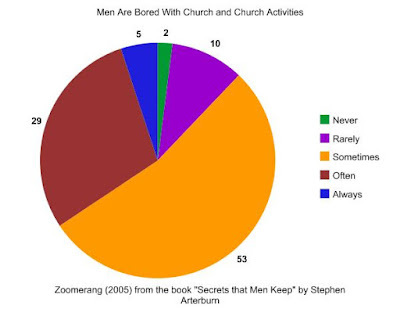 Notably, men are bored with church. Author Steve Arterburn employed the professional polling agency Zoomerang to poll men (about 3,600) on various questions about life. One had to do with their satisfaction about church and activities connected to it. Most men are at least sometimes dissatisfied with church and a sizable minority are often to always bored. Evaluation: As the data above shows, men are more times than not more skeptical than women when it comes to the Bible (though I know there will be exceptions to these findings and I acknowledge the need for relational/rational apologetics for women as well). Moreover, they are more often than not dissatisfied with church in general. Engaging their views about the Bible would probably bring alive the text that can be transforming thus they would often not be bored with church in general. However, if they more often than women think Scripture is a book of ancient fables and is not true in general, then they will probably not pay attention to what is being taught if what is being presented is shallow. More in depth apologetic rational and relational teaching options would probably turn this around. That being said, at least, fideism is no longer a viable option. As Douglas Whitney out of Southern Baptist Theological Seminary states, "I maintain that a biblically balanced Christian has both a full head and a full heart, radiating both spiritual light and heat." 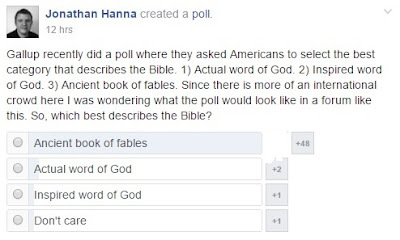 To aim for a more international community, I replicated the Gallup poll in a Facebook group called "Atheists and Christians Debate Central" and ended up with most voting the Bible is a "Ancient book of fables." Additionally, I also did a similar poll in more of a neutral group that includes theists, deists, agnostics, atheists, etc. 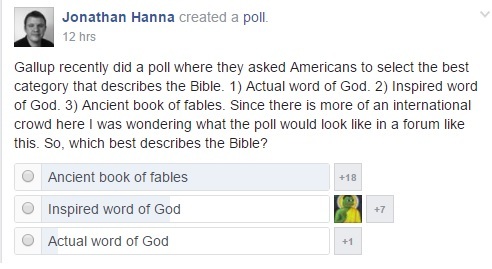 Ended up with similar though more chose "inspired word of God" than in the previous poll. In general, Americans view the Bible as either the "Actual Word of God and to be taken literally" or the "Inspired Word of God, though not always taken literally." However, in Gallup's measure of this through the years, those who take the Bible as an "Ancient book of fables, moral precepts, etc" outnumber the "Actual Word of God" category. Kinnaman, David. You Lost Me: Why Young Christians Are Leaving Church...and Rethinking Faith (Kindle Locations 270-273). Baker Publishing Group. Kindle Edition. Whitney, Donald S.. Spiritual Disciplines for the Christian Life with Bonus Content (Pilgrimage Growth Guide) (pp. 223-224). Navpress. Kindle Edition.